Today was the big day for the Halloween festivities at CVIS, Maxxi’s school. The kids dressed in costume for the school day, had a morning desfile de disfraz (costume parade), and there was a carnival this evening, complete with bake sale, cake walk, and a super scary haunted house with plenty of gorey zombies and even a chainsaw (we skipped that attraction – Maxxi due to being 3, and us due to the immense waiting line to get in… I was bummed not to experience the horror first hand, but I am more horrified by standing in lines I suppose). 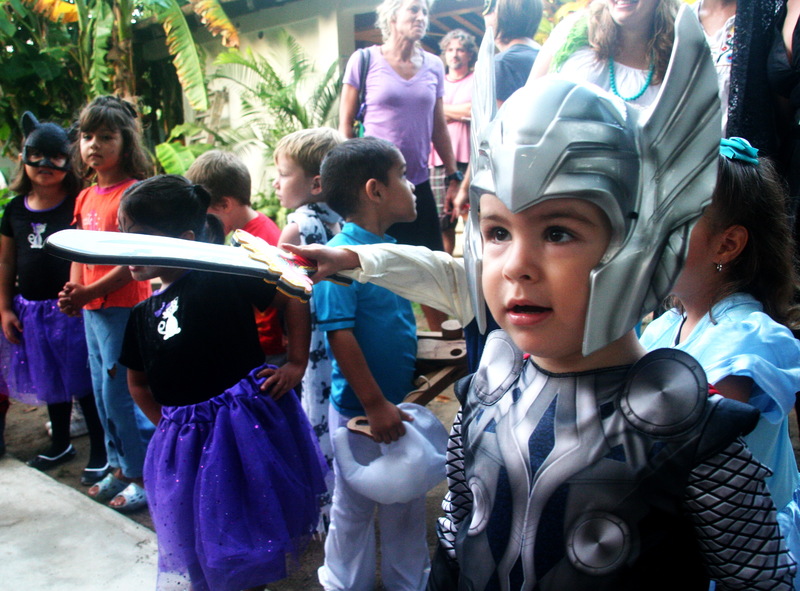 This year Maxxi dressed as Thor, God of Thunder. My dad brought down his awesome costume, and we had given him a sweet nerf Thor’s hammer for his birthday which has since been a favorite toy. Of course, after 2 months of having the hammer around, the night before dress-up day we go out to dinner and come home to find the hammer – the HAMMER! – destroyed by the dog. Gabbi was the one to discover the disaster and when I came down from putting Maxxi to sleep, he was so heartbroken I thought maybe the cat had died. No wait, he was more heartbroken than that. Gabbi got busy making Maxxi the coolest “Capitan Mexico” shield and helmet (converting the previous iteration of Captain America shield & helmet that he made him last week), and I managed to rebuild the hammer using an ipod box and duct tape. Whew – day saved by late-night craftiness. Thor had his hammer, and a super rad Capitan Mexico costume for Friday show-and-tell. Of course this hammer actually packs a punch vs. the nerf version – I was a little worried about sending him to school with an actual weapon, but I didn’t hear any reports of bludgeoning from the teacher (that would be “Miss America,” by the way) so I guess we’re all good. 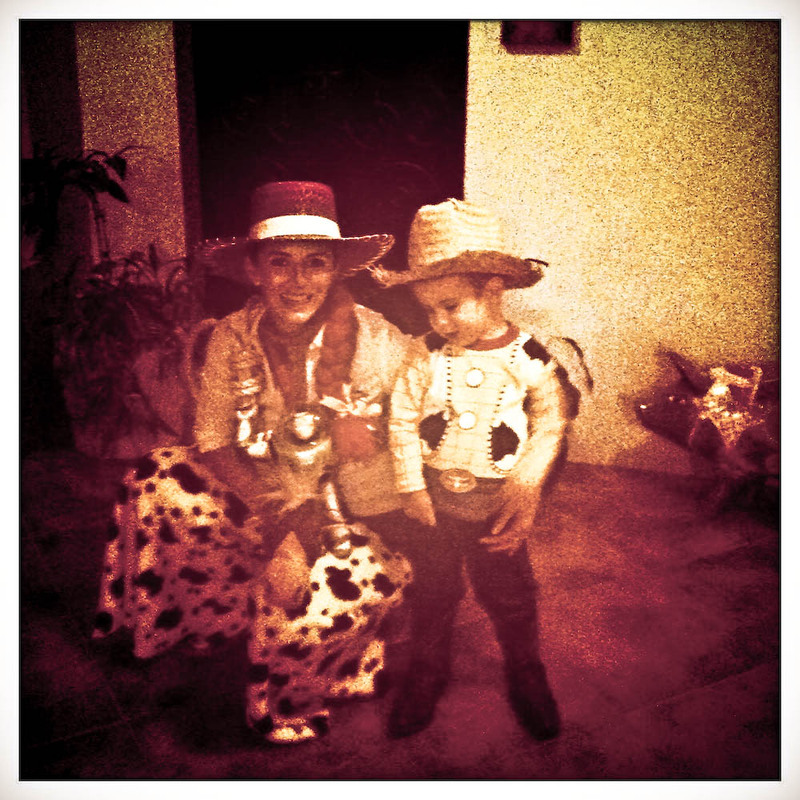 I made what turned out to be a darn-tootin’ good Jesse (Toy Story) costume that was a big hit with the little ones. 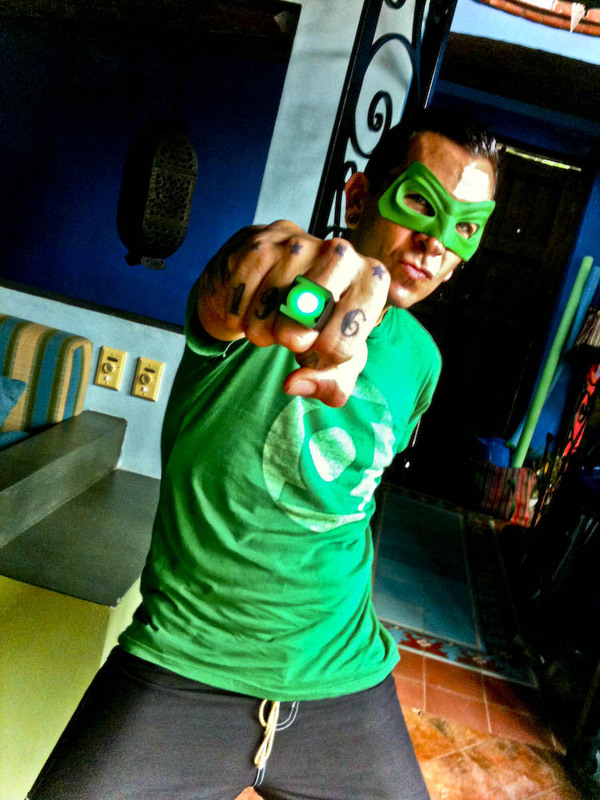 Gab went as Green Lantern, Sayulita sector, but Maxxi commandeered his mask and ring mid-way through the night, becoming Green Thor of Asgaard sector. 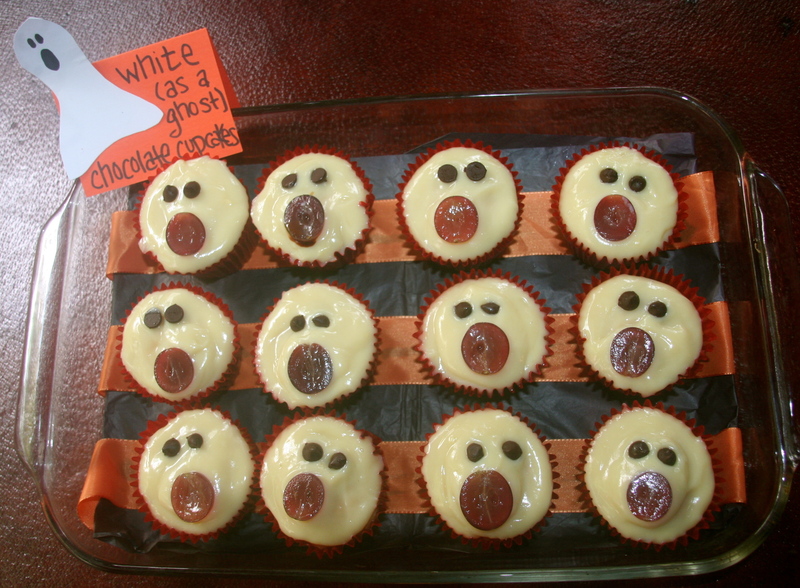 I also made my first batch of school bake-sale cupcakes: white-as-a-ghost white chocolate mud cupcakes. So yum. I made these for Gabbi’s birthday (white chocolate being his fave) and they are delicious and quite easy. Get the recipe here. All in all, a great start to another halloween with our little king-of-costumes. Before bedtime, I just had to coax Maxxi into his “Woody” PJs (and boots and hat) for a Woody’s Roundup cast reunion photo. Buenas noches, vaquero, you inspire me so. 2 Days Early – Yee-Haw!! Hurry home, lover. You are missed. Ten years ago today Gabbi and I went on our first date. It was a date I had anticipated and imagined for so long, as I had fallen for him hard over the course of our almost-year-long friendship to date. It was the start of a rare and magical love affair that defines and shapes and guides both of us through this life. From that day we have been inseparable, a steel fortress of a unit, entwined, enamored, enmeshed, enveloped in each other. A decade. It feels like yesterday and it feels like a lifetime, as all that truly matters in life has happened since that day. Then, we were children, but mere shadows of our unfulfilled selves, and we were drawn to each other through the most unlikely of circumstances. Such is true love, and I am so lucky in love to have found mine in Gabbi. My man who adores and worships me, entertains me, supports me, romances me, loves me, and always reminds me what is most important at the beginning of the day: us, our love, and the family we have created and hope to grow. To share a bit of the awesome-ness that is my husband… A few weeks ago I walked into our bedroom while Gabbi was out on a run, and found this card on my pillow. How amazing is my man? I am blown away by his devotion; his every-day-tell-me-how-much-he-adores-me-and-can’t-live-without-me; his ability to catch me off guard and surprise me with some new way of expressing his undying love. Gabbi, you are so cool. Thanks for asking me out all those years ago. Thanks for being the best boyfriend and friend and husband and partner and father and baby-daddy a girl could dream of. Here’s to the next 10 decades. 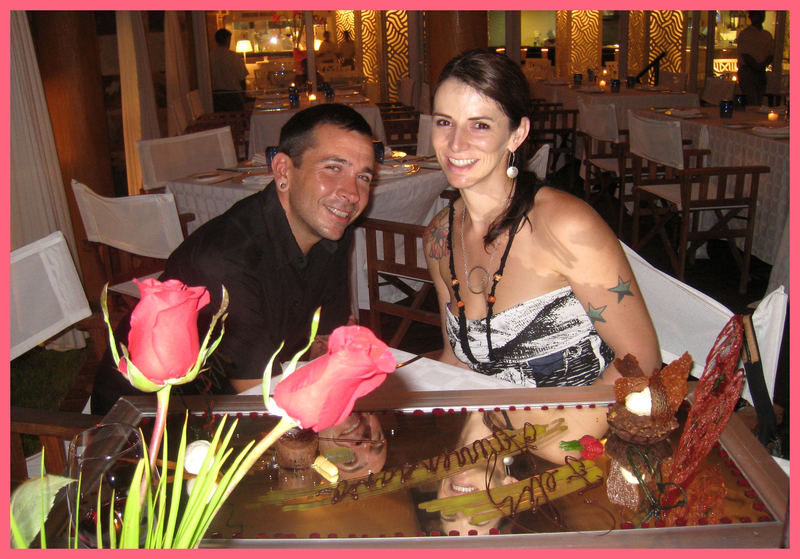 Ten years ago today Gabbi and I went on our first date. It was a date I had anticipated and imagined for so long, as I had fallen for him hard over the course of our almost-year-long friendship to date. And it was the start of a rare and magical love affair that defines and shapes and guides both us through this life. From that day we have been inseparable, a steel fortress of a unit, entwined, enamored, enmeshed, enveloped in each other. A decade. It feels like yesterday and it feels like a lifetime, as all that truly matters in life has happened since that day. Then, we were children, but mere shadows of our unfulfilled selves, and we were drawn to each other through the most unlikely of circumstances. Such is true love, and I am so lucky in love to have found mine in Gabbi. My man who adores and worships me, entertains me, supports me, romances me, loves me, and always reminds me what is most important at the beginning of the day: us, our love, and the family we have created and hope to grow. A few weeks ago I walked into our bedroom while Gabbi was out on a run, and found this card on my pillow. "Andee (You're A Fine Girl)"
They say "Andee, you’re the best in town"
How amazing is my man? I am blown away by his devotion; his every day tell me how much he adores me and can’t live without me; his ability to catch me off guard and surprise me with some new way of expressing his undying love. Wow. Halloween was awesome. Little Maxxi Lobo dressed as “Max, King of the Wild Things,” and Mama was one of his savage subjects. Gabbi took off his costume and went as his true self, horns and all. This is the first Halloween that I’ve done the full-on homemade costume thing, and I must say, I’m feeling pretty good about my crafty self. Our dear friend Lisa Brewer, who was with us when Maximo came screaming into the big wide world, made Maxxi’s amazing, spot-on “wolf suit.” Sew impressive – honestly, I am always amazed that people can actually make things on sewing machines with fabric. And such a gift of her time and love to create this costume from scratch. Lisa, you are the best Tia and we love you so much!!! I made his little crown and scepter, and then managed to pull together my costume on Halloween day using Lisa’s magical glue gun, and Gabbi’s magical scale-drawing talents. We kicked off the evening in Sayulita’s town plaza, which was filled with families. I brought candy to hand out, and was immediately swarmed by kids chanting “Queremos Halloween” (“We Want Halloween!”), which is what they say here instead of “Trick or Treat.” I also got a few “Feliz Halloween”s and a “Halloween o Truco” (truco = trick). There were lots of great costumes on kids and adults. Our favorite was an adorable mummy baby, Jonathan. There were LOTS of kids dressed as devils, along with vampires, zombies, fairies, and the rest of the usual suspects. 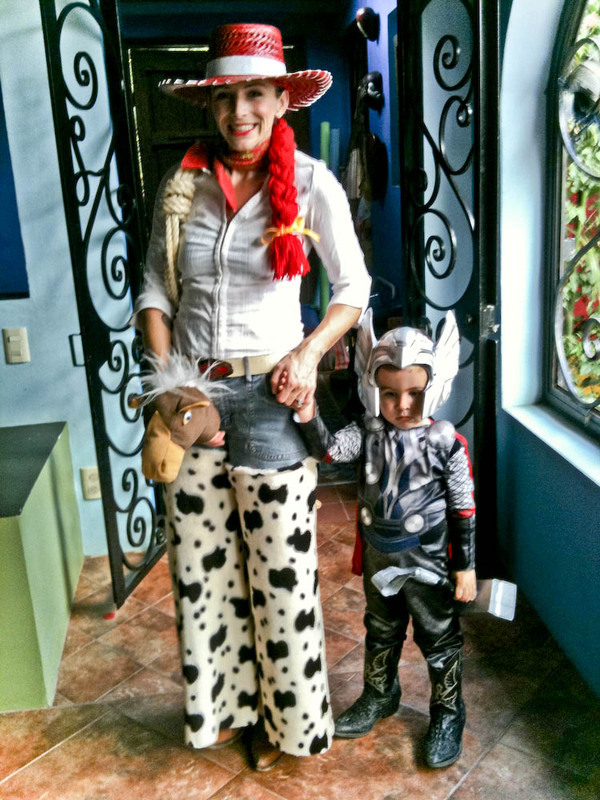 Maximo was such a champ and loved his costume. He actually wore his crown and was waving his scepter around at everyone, loving the crowds. I was roaring my terrible roar and gnashing my terrible teeth and stomping my terrible clawed feet, crying “Let the Wild Rumpus Start!” We had so much fun and were a big hit. After the plaza, we headed home to our street where our neighbors and great friends Tamra, Theo, and Talula were throwing a magical Harry Potter themed Halloween Party. The wild rumpus continued with a fabulous friend-filled fiesta and delicious blood-red (pomegranate) margaritas. This morning we got up early and walked down to Rollie’s for the first day of the best breakfast in town – ar guably anywhere for that matter. Rollie’s is a Sayulita institution, serving up some of the best pancakes you will ever eat along with a heap of love and all around feel-goodness, topped off with a damn good bloody mary (a critical counterbalance to those bloody margaritas from last night…). Being at Rollie’s again (they close for the summer from May – November) felt like being home, and it also feels like the official kick-off to the high season, which is ramping up in full force, along with our workload. But today was a lovely work-free Sunday, and after filling our bellies with entirely too much food for any sane person to eat on a regular basis, we packed up the good ship albion and cruised over to La Lancha, a gorgeous stretch of undeveloped white sand beach in Punta de Mita, and also my man’s favorite surf break. We were joined by our lovely friends Nick, Treva, Astrid, Steve and Laura. Tamra sent us with a bunch of yummies left over from the party last night, and we had a perfect day. The weather is just amazing right now – warm but not hot, no humidity, the ocean at the absolute perfect temperature. 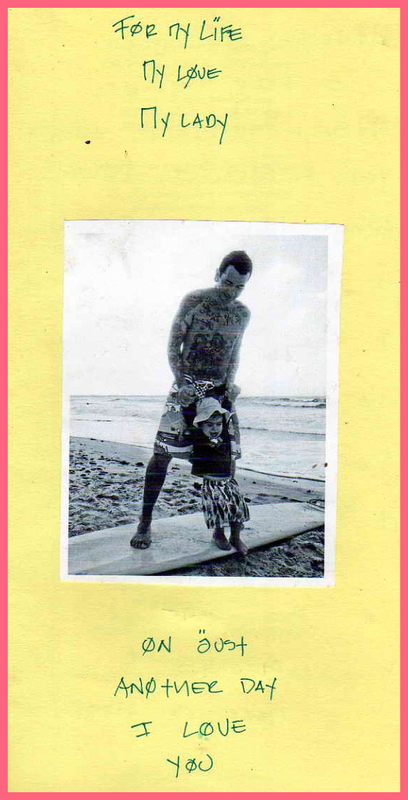 The sun was glistening on a gorgeous low-tide sea with sweet little long-board waves peeling gently into shore. This was our first time to the beach since Maxxi started walking and it was a whole new world. He had the best time walking around the sand, wading into the surf, collecting rocks and shells, playing with Dulce and Astrid, and just generally being his awesome smiley sweet self. We got to watch Gabbi surf for the first time, took some stellar photos, and saw the most gorgeous pink-lemonade sunset, followed by a full moon lighting up the drive home. Honestly, a completely perfect weekend. I am so filled with love for my family – for my super-hot surfer husband who showers me with so much love and is my best friend and favorite person to hang out with; and for my son – my sun – who though it seems impossible today, I know I will love even more tomorrow, because he keeps doing new and amazing things and his joy and wonder are utterly contagious. He cracks me up and makes me want to dance and run and sing and be silly and, well, this is why people love being parents. I am not even sure how to say it in a way that is particularly eloquent or that is not completely clichéd, but I feel this incredible surge of love and pride and joy and all around awesomeness when I think about and look at my boy. Everything he does is incredible and magical and smart and funny and perfect, and I see the world anew through his big brown eyes. I am so completely, totally, absolutely, madly in LOVE!!!!! And that, is perfect. In just a few days, my man turns 40. Pretty awesome, as he is riding high and looking foxier than ever. 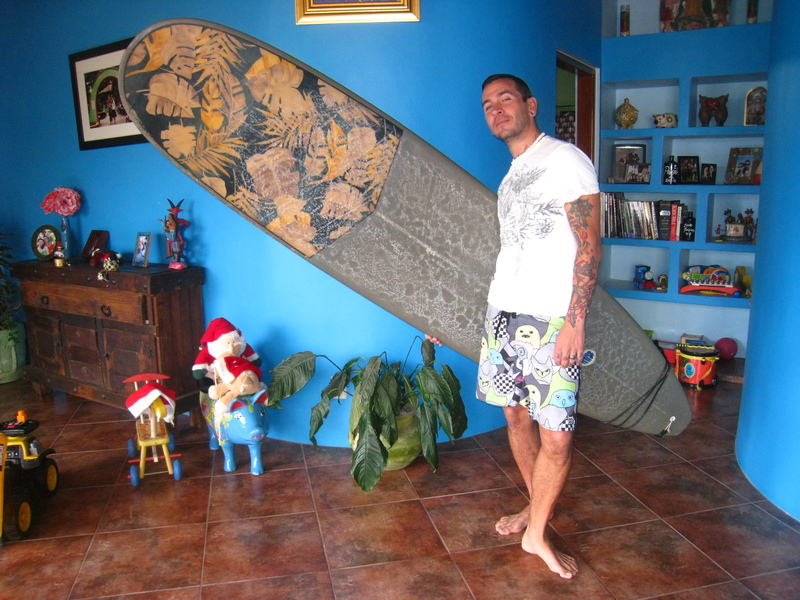 Super fit, great life, amazing dad, soooooo handsome, passionate and inspired about fun new things like surfing, and always by the good old classics like love and family. Those are just a few musings about my incredible husband. Let me tell you, I hit the jackpot when I met Gabbi. 10 years ago – ten! – he walked into my life when I walked into a job interview, and destiny changed both of our paths forever. It’s crazy to think that it has been a decade. It feels like yesterday and at the same time it feels like we’ve known each other forever and always. Gabbi’s birthday is always one of my favorite holidays of the year, as I love celebrating the awesomeness that is my best friend, my husband, my partner, my man. He relishes growing older and wiser and tends to add a few onto his upcoming age (having been “almost 40” for about 5 years now). We have a long-standing tradition of going away for Gab’s birthday and this year we rented a penthouse-level condo on the beach in old town Puerto Vallarta. We’re looking forward to getting away for a few days with our son, experiencing a different side of a town we only know for errands and work, and celebrating 40 years of super-coolness. I can’t wait. Happy Birthday, My Love!! Last week Maximo Lobo turned 1 year old. In celebration, Nona & Nono Villarrubia and Grampa Billy came to visit for the week. We had a wonderful time with all of them, and were all super spoiled by having so much Grandparent love in the house. It feels like Maximo does something new every single day these days, and it was extra special to experience his awesomeness with the only other people (along with Grammy Karen & Papa Mark!) who can match (exceed?) our own enthusiasm for our offspring. Getting to see him settle into his comfort with each of them is always cool to watch. It’s been about 6 months since he’s seen them, so it’s takes a day or two, but by the end he is so into them all, forming unique relationships with each, and it’s a beautiful thing to witness. Of course, the coolness of being able to hand him off to people who love him as much as you do and want nothing more than to hang out with him all day long cannot be overstated. Such a lovely freedom, and a hard one to give up – for Maximo, who was constantly attended to and entertained; and for me, who didn’t have to constantly attend to and entertain. I remember the early early days… the first round of Grandparent visits during months 1 and 2… how I would find myself feeling almost jealous as I handed off my newborn babe to the waiting arms of his Abuela or Grammy, concerned that I was sacrificing too much of my precious bonding and attachment time. Now, securely attached beyond a doubt one year later, I have no problems handing my son off to willing and able hands – we get plenty of time together, me & him, and I cherish it. Gabbi and I have been reflecting a lot this week on how lovely it was to have our folks here, and how different it is to have family visit now that we have a child. We love our parents dearly, and have for the most part lived far away from them as adults (me more so than him). I have never felt particularly attached to home as “a place where I grew up,” and moving away was a big part of claiming my independence as a young adult. I’ve always preferred living away from my parents, for the freedom it gave me. They are also relatively young and busy with their own lives, so it generally seemed like enough to see each other a few times a year, not to say we didn’t miss each other. Now that I’m a parent, I find that my priorities and wants have shifted. Family is more fun – less obligation, more celebration. We all get along better. Everyone seems happier; renewed and re-energized by this new life that we all share a boundless love for. The time flies by and ends too soon, whereas a younger, more selfish me would have grown tired of day-upon-day with parents around. Now Gabbi & I imagine a time in the future when Maxxi’s Grandparents will hang their hats in our home, or one of their own nearby, at least part of the year. Because he needs his Grandparents in his life more than a week at a time, and so do we. For this, we put everything we have into expanding our home so we have an extra bedroom to share with our families (and our friends – come visit now!). For this, we will keep putting it out there; keep planting the seeds of ideas about making a life here until it can’t help but take root. And we will keep counting the days until that next visit, which thankfully comes more and more frequently as we all shift our priorities towards Maximo, and find whatever ways we can to get ourselves together. Fortunately, we can already start ticking them off as we look forward to our big Christmas reunion. ¡Hasta Navidad!